This week I bring to you an Autumnal guest post from creative blogger Sandy who has some wonderful ideas for bringing the season’s sights, colours and scents into your living space. 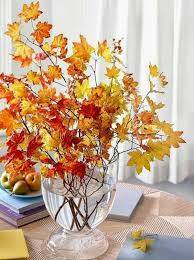 Pick a few branches of colorful fall leaves, and arrange simply in a tall glass vase filled with water. From this bold focal point, build out the rest of your tabletop display. Gather an array of seasonal gourds in a mix of colors, sizes, and textures for variety. Stack flat gourds of graduated sizes, and top with a large glass (available at crafts stores or online). Fill another smaller glass with bleached pinecones, and invert; feel free to improvise. Add a potted plant to the arrangement for texture. 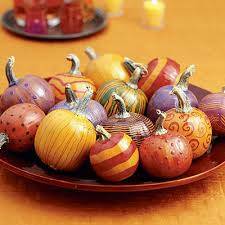 Place small gourds around the larger items, and scatter brighter fall leaves along the table. Take a round or oval container, and fill it with potting soil. Plant a mix of succulents (such as echeverias) toward the center of the bowl, leaving plenty of room around the edges. Nestle small orange and white pumpkins into the soil. Add seasonal vegetables like kale, radishes, and eggplants. Use bundles of fresh herbs (such as rosemary and sage) to fill in any gaps. 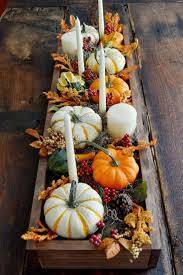 Surround with more pumpkins and votives. Fill a rustic container two-thirds full of water. 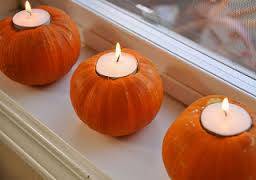 Use a craft knife to trace circles a little larger than the bottom of a tea light into the orange mini pumpkins. 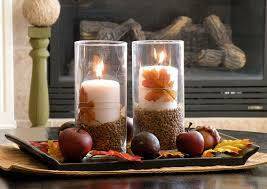 Cut and carve out the circles to allow a candle to fit inside comfortably. Insert tea lights. 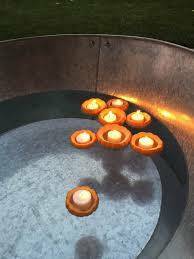 Float pumpkin votives as well as whole pumpkins in water. 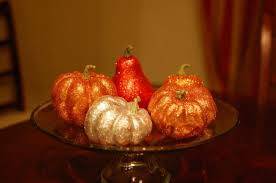 Trade the usual fresh gourds for jewel-tone painted dried ones. Start with dried gourds in varying sizes. For crisp lines, apply painter’s tape around the middle of a gourd. Paint half of the gourd with latex wall paint and remove tape when dry. For a drippy effect, pour 1⁄4cup paint into a resalable plastic storage bag. Snip a corner to drizzle paint around the middle of a gourd (like piping frosting). Using a foam brush, carefully extend paint up from the drips, adding additional paint as necessary, to reach one end of the gourd. Pile painted gourds on a mantel or shelf or in decorative bowls. 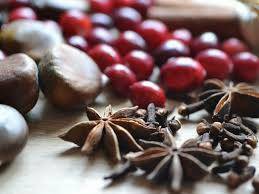 The way to do it is to think of the smells that remind you of autumn. The traditional way to fix a simmer pot is to fill a saucepan with some water, then add apple slices, some cinnamon sticks, maybe some orange slices as well and some cloves. Add a couple of drops of your favorite essential oil to the water. 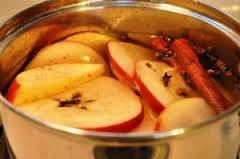 Let it simmer, and as the mixture heats it will ignite your house with warmth. Your guests will ask for your secret! You can also buy or make scented candles for smell and style combined! This article was written by Sandy Love. She is a regular blogger at ALRUG and loves to to write articles on home decor and interior designing concepts.